George Victor Browning was one of them. George Victor Browning had joined the Department of Trade and Customs, as a junior clerk, in 1915. He was one of six children (five boys and one girl) born to Charles and Ellen Browning of Eastbourne Street, Windsor, a suburb of Melbourne. The Brownings saw four of their boys off to war, the fifth, Roy, being too young. Walter, serving in the 22nd Battalion, was killed in action at Bullecourt on the 3rd of May 1917. He would have been only a short distance from his brother George who was in the same action. Norman, serving with the field artillery, was wounded but returned home safely at the end of the war. Charles, the first to enlist in August 1914, served at Gallipoli and in France, also returning home at war’s end. When George enlisted on January the 24th 1916, his three older brothers were already in uniform. As George marched into the recruiting depot he would have been determined to enlist and join his brothers, in particular Norman and Walter who had signed up only eight or nine days earlier. At only five feet four and a half inches tall, he needed to stretch a little to make the grade. This was helped, no doubt, by his thick mop of black hair, which could have accounted for an extra inch or so. He would also have hoped that his pale complexion and protruding ears did not give the recruiting officer reason to question his age, because he was going to tell a lie. George was to give his age as 18 years when, in fact, he was only 17 years and 4 months. He need not have worried; the war machine was too hungry for new recruits. George was posted to the 13th reinforcements of the 21st Battalion and commenced his training at Broadmeadow Camp. Early July saw his unit board the transport “Ayreshire”, arriving in France on November the 22nd 1916, via a two month training session in England. No summer sports for these lads, it was straight into a miserable winter on the Western Front. Life in the trenches was no boy scout camp. If the Germans weren’t trying to kill you, then nature would take over. 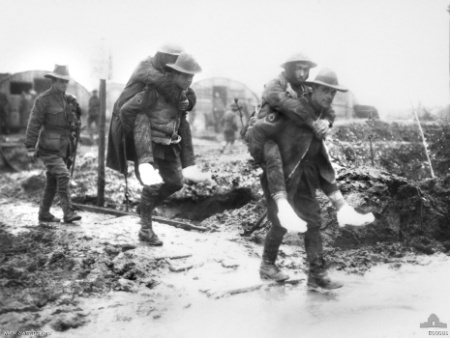 Mostly, everything bad happened at once and one of the most miserable impacts was a disease known as “trench foot”. Trench Foot was, in fact, a fungal infection brought on by prolonged exposure to dampness. If not treated, gangrene and amputation could result. George Browning found the harsh conditions of that first winter in France cared little for sensitive southern feet and he was an early victim of trench foot, being hospitalised for three months in early 1917. However, he was able to return to his unit in time for the action at Bullecourt on May the 2nd, the same battle that saw his brother killed. Another bout of trench foot in August/September 1917 saw George have a further break from the front, but he was back in the thick of things by the time the Australians advanced and captured Broodseinde Ridge, east of Ypres, in October. Late 1917 saw the Australian army in a rather battered state. Units had been heavily depleted and replacements were both slow in arriving and inexperienced. It was time to draw breath and take stock. For George Browning, this meant a period of leave in Paris, followed by a further three weeks in Britain, together with participating in the regrouping that was being undertaken. However, the human harvesting machine demanded more fodder and, by late March 1918, it was back to work. April 1918 saw the beginning of actions that would eventually lead to the German surrender. The 21st Battalion, with many other Australian and allied units, took part in battles at Hamel, Amiens and Mont St Quentin. The 21st suffered heavily and was, by September that year, reduced to barely company strength. In late September, the order was given to disband and reinforce other units. However, the survivors of the 21st had other ideas and on the 25th of September they mutinied. Commonsense seems to have prevailed and the order to disband was withdrawn before the day was over. Yet, the writing was on the wall. The 21st Battalion fought its last engagement at Montbrehain on the 5th of October and was withdrawn from the front the next day, being finally disbanded on October 13th. George Browning was redeployed to the 24th Battalion on that day and returned to Australia in June 1919. He was discharged from the AIF shortly afterwards. far left in light suite and dark hair. George returned to his employment with the Department of Trade and Customs and was married to Olive in the early 1920’s. They had, at least, two sons and the young family relocated to the new national capital, Canberra, around 1930, taking up residence in Lister Crescent, North Ainslie and, later, in Toms Crescent, Ainslie. Following the family example, George and Olive’s boys enlisted in the services during World War 2. Walter joined the navy in 1942, returning home safely in 1945. Victor joined the army in 1944, but sadly died of illness in 1945 while still undergoing training with 19 Infantry Training Battalion. George Victor Browning passed away in Canberra on the 19th of March 1971. He had done his duty.